Endurance.net's first "Between the Ears" photos showcased beautiful trails and fun adventures from around the USA, and the world. Riders shared their favorite photos of the view between the ears of some of their favorite mounts on some of their favorite rides. 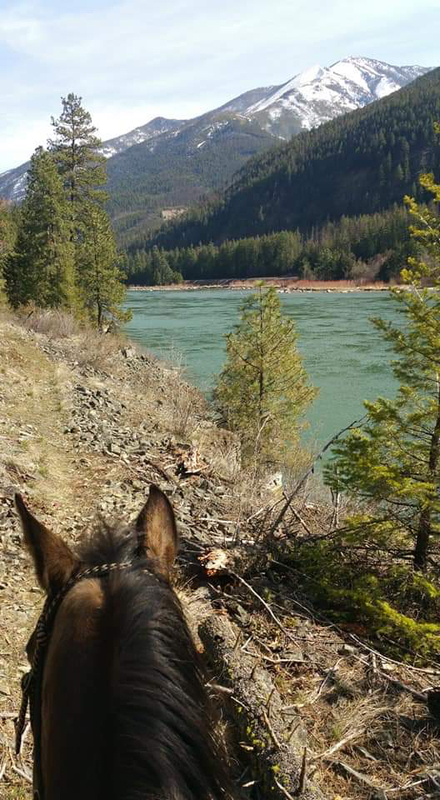 First place winner, by highest number of votes, is Bonnie Girod and her grade half Arabian, Luna, riding along the Kootenai River in Libby, Montana. We'll have a profile of Bonnie and Luna soon. Bonnie will receive a small painted portrait of her choice, courtesy Steph Teeter (www.idaho.com/StephTeeterArt/consignment/ ). Winners will be contacted. We will keep a link to our running contests on our Endurance.net/Events page, and this gallery will live on our EnduranceNet Facebook page, at https://www.facebook.com/pg/wwwendurancenet/photos/?tab=album&album_id=2403605336330158. Congratulations everybody, and thanks to all the entrants and voters who participated in our first "Between the Ears" contest. Stay tuned for more!